Beach and Bush’s Minute To Win It Cocktail Challenge team build is a fantastic alternate to physical team building and a sure way to get the party started. A low impact challenging event based on the popular TV series of the same name. Hilarious tasks await contestants as they compete head to head for their team. Participants spend time in groups completing low-impact / mentally challenging tasks in a set time limit as per the popular television show. They then end off by creating unique cocktails which are graded and presented to the group. A stage is set up for the event and teams face off as they watch the show unfold before them. The first stage consists of groups competing directly across a series of classic ‘Minute 2 Winit! puzzles and tasks. The first stage consists of groups competing directly across a series of classic ‘Minute To Win It! puzzles and tasks. Team Members earn points as they attempt to complete seemingly simple but deceptively challenging activities in the allowed 1 minute time period. Using only the face, move cookies from the forehead to the mouth. With a pedometer attached to the forehead, move the head around to record 125 total “steps” in a minute. Knock over empty cans using a yo-yo tied to the back of the waist. A unique Beach and Bush creation, teams compete to draw Pictionary descriptions in real time on giant white boards. Player must shoot rubber bands to knock a triangle stack of 6 cans completely off a platform. Incrementally build a wobbly tower of cups and ping pong balls by bouncing a ball off the ground into a growing stack of cups held in the hand. Stack 5 wooden baby blocks on top of plastic plate balanced on top of the head. Stand 20 empty CD cases on a table in a horseshoe formation. Set them off using a domino effect around a designated spot and so that the final case falls off the table. 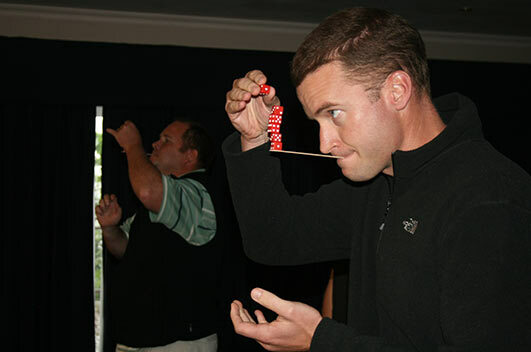 Balance six dice on a popsicle stick held in your mouth. clenched jaw and ninja like focus. Player must hold a stack of blue cups with 1 red cup at the bottom. Player must move cups 1 at a time from the top to the bottom of the stack, trying to cycle the red cup back to the bottom of the stack. Groups are then scored and access to a wide range of cocktail mixing ingredients, garnishes etc are dependent on the score attained. Using limited resources, teams must then mix up a storm to create the ultimate cocktail. Teams present their cocktails to the panel in front of the entire group and our experienced judges sample and rate the creations, often a hilarious undertaking! All team members then have access to the bar to mix additional cocktails, a great party starter. At the end each group must present their cocktails and explain them, they are judged and the cocktail champions are announced.